MuscleTech Hydroxycut CLA Elite Next Gen at Bodybuilding.com - Best Prices on Hydroxycut CLA Elite Next Gen! Order and automatically receive 40% Off Hydroxycut CLA Elite Next Gen, 100 Raspberry Flavored Softgels! 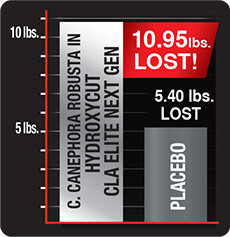 1Subjects taking the key weight loss ingredient in Hydroxycut CLA Elite Next Gen (C. canephora robusta) lost 10.95 lbs. in 60 days with a low-calorie diet, and 3.7 lbs. in an 8-week study with a calorie-reduced diet and moderate exercise. Hydroxycut CLA Elite Next Gen is a powerful new addition to the weight loss family from the brand that brought you two decades of excellence. Uniquely formulated using a key ingredient backed by two scientific studies, MuscleTech researchers have engineered a unique formula that will deliver a truly amazing experience. You won’t find any proprietary blends in the Hydroxycut CLA Elite Next Gen formula. This product offers 100% transparency along with 100% quality. We don’t use the low-concentration CLA you’ll find in other formulas. This formula is a high-quality non-stimulant formula offering a unique array of ingredients – it’s the perfect addition to your supplement stack! In addition to the scientifically studied weight loss driver C. canephora robusta and the purest form of CLA on the market, Hydroxycut CLA Elite Next Gen delivers L-carnitine L-tartrate, Garcinia indica and raspberry ketone. L-tarnitine L-tartrate is an amino acid that is involved in many different processes in the body. Unlike Hydroxycut CLA Elite Next Gen, many other CLA products on the market offer low-quality CLA. 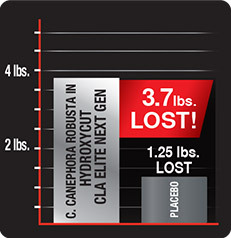 In one study, subjects taking the key weight loss ingredient, C. canephora robusta, in HYDROXYCUT CLA ELITE NEXT GEN for 60 days lost, on average, 10.95 lbs. versus the placebo group, which lost an average of 5.40 lbs. Both groups followed a low-calorie diet.